WHEN Bush senior attacked Iraq 12 years back, he had the support of nearly the entire world with him. After all, at stake was the independence of Kuwait. What a seachange has come about in these years! His son, the present US President, has few backers, including his faithful ally Britain. Not only the Muslim world but also most of Europe has stood up against his pet obsession. THE tripartite agreement reached between the Centre, the Assam government and the Bodo Liberation Tigers (BLT) in New Delhi on Monday should hopefully set the pace for a peaceful and durable solution to the Bodo problem. This issue has been engaging the attention of successive governments at the Centre and in Assam for well over 10 years, but no solution could be found for one reason or the other. THE clouds of politics have somewhat taken away the focus from the on-field contest in the eighth Cricket World Cup that opened in South Africa on Sunday. So far Zimbabwe was in the news for all the wrong reasons with England and Australia wanting their games to be moved to South Africa because of imagined fear of the safety of their players. EVEN as New Delhi appears to be obsessed with its Islamabad-centred concerns, the USA seems determined to reassess its past priorities and policies in the Islamic world in general and the Middle-East and the Persian Gulf in particular. Eid-uz-Zuha is being celebrated today. WHAT is sacrifice? A mother sacrifices her sleep for her children. A father sacrifices all his comfort for his son. Prophet Mohammed himself has been the embodiment of sacrifice all his life. The sacrifice of the animals is just a ritual whereas the essence lies far beyond. BABANPUR (Haryana): Deshraj Buta, a young and educated Sarpanch from Babanpur village in Haryana, is a handsome young man with a mission to turn his village into a model for the rest of the state to follow. Buta, a Dalit, has faced social discrimination and other hurdles in his life to reach the post of Sarpanch. JUST take three fewer bites of that burger and you will stop gaining weight. Or walk an extra mile everyday — and going up and down the stairs counts. WHEN Bush senior attacked Iraq 12 years back, he had the support of nearly the entire world with him. After all, at stake was the independence of Kuwait. What a seachange has come about in these years! His son, the present US President, has few backers, including his faithful ally Britain. Not only the Muslim world but also most of Europe has stood up against his pet obsession. It is not clear whether the details of the Franco-German peace plan have been deliberately leaked out or not, but it is obvious that these two influential countries are just not prepared to be hustled into military action. They are willing to do anything to avert war, including the tripling of the number of weapons inspectors, the deployment of UN troops and the declaration of all of Iraq’s air space as a no-fly zone. What is interesting is that even smaller countries are amenable to these suggestions and are making their preferences known. Washington is learning to its chagrin that it has very little support in Europe beyond the small countries that gained independence from the USSR. This gathering movement flies in the face of the derogatory use of the term “old Europe” by Defence Secretary Donald Rumsfeld for France and Germany. Well, the “old-ness” seems to be spreading far and wide. It is not as if these dissenting nations feel that President Saddam Hussein is innocent. All that they want to stress is that there is no legal basis for the use of force against him. There were red faces galore in London last week when it was found that what was purported to be intelligence reports about the weapons of mass destruction in Iraq were actually a modified copy of the thesis of a university scholar. Ironically, even the weapons inspectors are not categorical about his guilt. The USA refuses to ask itself a simple question: would it have allowed any other country to launch a similar attack on the basis of exactly similar evidence? There are millions of protesters within the USA as well. But Washington seems determined to march ahead. President Bush is perhaps generating this war hysteria to hide his failure to net Osama bin Laden. From all indications, this will be an almost solo show, because the United Nations is unlikely to endorse a military operation at this stage. The consequences can only be catastrophic. Iraq will be reduced to a ghost country. The economies of many countries, including India, will suffer irreparable damage. The relevance of the UN will receive a body blow. The Muslim countries will be badly alienated. And terrorism, which is sought to be stamped out, will raise its ugly head at the unlikeliest of places. All this because Uncle Sam cannot control his itching finger on the trigger! THE tripartite agreement reached between the Centre, the Assam government and the Bodo Liberation Tigers (BLT) in New Delhi on Monday should hopefully set the pace for a peaceful and durable solution to the Bodo problem. This issue has been engaging the attention of successive governments at the Centre and in Assam for well over 10 years, but no solution could be found for one reason or the other. Unfortunately, those associated with the movement for a separate statehood for Bodos had indulged in mindless violence for years. Many innocent lives were lost and property worth crores of rupees destroyed in the violence. The Centre has been firmly maintaining that a peaceful and mutually acceptable solution to the problem could be worked out only after the Bodo activists gave up violence and held negotiations with the government across the table. The late Rajesh Pilot took the first peace initiative in 1993 when he visited Kokrajhar in Lower Assam as the Union Minister of State for Home and appealed to Bodo leaders to join the national mainstream. An 18-member Bodoland Autonomous Council (BAC) was constituted in May, 1993. However, there was a general impression that it did not reflect the true aspirations of the Bodo tribals living in Lower Assam. The tribals have also been demanding autonomy for genuine development of the backward Bodo-dominated areas as also protecting the interests of non-tribals residing within its demarcated area. According to the new agreement, the existing BAC will be abolished as soon as the 46-member autonomous body called the Bodoland Territorial Council (BTC) is constituted. The people of the Bodo region will get an opportunity to participate in the decision-making process with the election of 30 tribal members to the BTC. In addition, five non-tribals and five from other groups will also be elected. Six members will be nominated by the Governor from the communities not otherwise represented. The BTC, covering about 8,000 square km, would comprise 3,082 villages and a population of about 23 lakh. A three-member Delimitation Commission will decide about the status of an additional 95 villages. Monday’s agreement, which was signed in the presence of Deputy Prime Minister L.K.Advani and Assam Chief Minister Tarun Gogoi, is expected to usher in an era of peace in the underdeveloped region. What is more, according to a package announced by the Centre, the Bodo people will get Rs 100 crore a year for infrastructural development as also a Central Institute of Technology (to be upgraded subsequently as a Central University). The Centre has also promised to include the Bodo language in the Eighth Schedule of the Constitution. “Bodo Kacharis” living in Karbi Anglong district need not be worried about their status as the Centre has agreed to consider their demand for a Scheduled Tribe (Hill) status. THE clouds of politics have somewhat taken away the focus from the on-field contest in the eighth Cricket World Cup that opened in South Africa on Sunday. So far Zimbabwe was in the news for all the wrong reasons with England and Australia wanting their games to be moved to South Africa because of imagined fear of the safety of their players. In these troubled times no one is safe anywhere. For this reason alone their expression of concern has few buyers. But what two Zimbabwean players did on Monday during their rain-ruined match with Namibia is the stuff that is likely to make them role models not only in their own country but also in regions where democracy is in peril. Ideally sport and politics should never be mixed. But the import of what Zimbabwe's best known cricketer Andy Flower and the colourful Henry Olonga did has to be understood in the context of the appalling political situation in Zimbabwe. The two cricketers wore black arm bands as a symbol of protest against the death of democracy in their country. The statement the two players issued should make the international community pay attention to the human rights violations under the repressive rule of Mr Robert Mugabe. The statement said - "We cannot in good conscience take to the field and ignore the fact the millions of our compatriots are starving, unemployed and oppressed. We have heard a torrent of racist hate speech directed at minority groups.... thousands of Zimbabweans are routinely denied their right to freedom of expression. People have been murdered, raped, beaten and had their homes destroyed.... We pray that our small action may help restore sanity and dignity to our nation". The free world should say "amen" to this. It was an extra ordinary gesture. A point that needs to be emphasised is that Andy Flower is white and Henry Olonga is black. By holding hands and issuing a joint statement the two players have sent out a powerful message to those who seek to discriminate between man and man on the basis of the colour of their skin. In sharp contrast what the Australians and English players have done amounts to penalising the Zimbabwean cricket team for the acts of the political leadership. What Andy Flower and Henry Olonga have done is give a powerful blow for freedom of speech, freedom from want and exploitation across the globe. In doing so they have followed the voice of their conscience and should be respected for that. The two may have to pay a heavy price for speaking out against the "death of democracy in the country". If they are penalised they shall be in the illustrious company of US boxing legend Mohammad Ali, who as Casius Clay refused to fight in the Vietnam war and was stripped of his world title. They shall also be in the company of American sprinters Tommie Smith and John Carlos who gave a black power salute during the 1968 Mexico Olympics to protest against the treatment of blacks in the USA. Unconfirmed reports say that England have decided not to play in Zimbabwe. They should review their decision as an expression of respect for Zimbabwean cricket. EVEN as New Delhi appears to be obsessed with its Islamabad-centred concerns, the USA seems determined to reassess its past priorities and policies in the Islamic world in general and the Middle-East and the Persian Gulf in particular. The State Department’s Richard Hass had asserted last month that the growing gulf between the regimes and citizens of many Islamic countries increasingly limited the ability of these regimes to ”provide assistance to, or even to acquiesce in American efforts combat terrorism or address the proliferation of weapons of mass destruction”. Mr Hass argued that “Greater democracy in Muslim majority countries is good for the people who live there. But it is also good for the United	States”. Secretary of Sate Colin Powell has now made out he case that an American success in Iraq would “fundamentally reshape” the Middle-East and the Persian Gulf. The extent of the American determination to leave no stone unturned to “reshape” even its own former allies, including Saudi Arabia, was mentioned to me during a rather interesting exchange I had with a distinguished former CIA official. I was made aware of the depth of American feeling after the terrorist attacks on New York and Washington, when this former official said that the USA now regarded itself as being in the midst of the “Fourth World War”. The first two World Wars had been won militarily and the Third World War against the Soviet Union had been won without a single bullet being fired on the adversary. The “Fourth World War”, I was told, would involve taking the fight to the “enemy’s territory” and signalling to countries that harbour terrorists that “their sovereignty is at risk”. More importantly, I was told the USA was particularly angry at countries that used “so-called charities” to fund individuals and organisations promoting fundamentalism and religious extremism, that threaten the stability of pluralistic societies across the globe. While all this was certainly not the official position of the Bush Administration, it did signal a determination in influential circles in Washington to even take on the erstwhile allies who are now having their ordinary citizens fingerprinted, photographed and registered in the USA. An America-led war against Iraq now appears inevitable. Iraq’s immediate neighbours are now lining up behind the Americans. Turkey is getting its bases readied and Qatar, Oman, Kuwait, Bahrain and the United Arab Emirates have all made their support for the Americans very clear. There have been unpublicised contacts between American and Iranian officials in Europe, and the Americans are said to have been reassured that Iran will not play spoil sport in their war on Iraq. 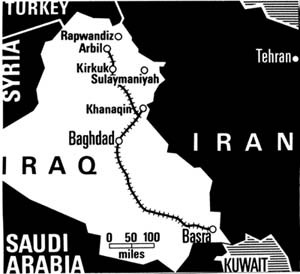 In any case, Iran has for long maintained contacts in Iraq with those opposed to the Government of President Saddam Hussein. It is only a question of time before Saudi Arabia and Egypt quietly fall in line with American imperatives. While France and Germany appear to be resolutely opposed to any precipitous American military action in Iraq, the European Union is clearly split, with important countries like Spain and Italy endorsing the Anglo-American approach. The days ahead are going to be crucial for American efforts to obtain a fig-leaf of legitimacy for military action from the Security Council. While the USA has been restraining the Kurds and Turkey from seeking any territorial advantages in cities like Kirkuk and elsewhere, from the emerging situation, it remains to be seen if the Americans will remain steadfast in preserving the unity and territorial integrity of Iraq. They did not set a particularly welcome example in Kosovo. Hasan observes: “The Saudis wanted to see all the non-Arab Muslim majority countries detach themselves from secularism and other “infidel” political ideologies and join the Arab hegemonistic Islamist camp”. Even today, virtually every Islamic fundamentalist and terrorist organisation ranging from the Harkat-ul-Mujahideen in Pakistan to the Jamaat-e-Islami in Bangladesh are known to receive funds and support from Saudi Arabia. Pakistan is not going to remain immune from the American drive to end funding and support for armed, Islamic fundamentalist groups in the long run. It is not without significance that the soft-spoken American Ambassador in Islamabad, Ms Nancy Powell, has asked Pakistan to cease remaining a “platform” for global terrorism. General Musharraf has warned that Pakistan itself would be a target, after the Americans address their present priorities in the Persian Gulf. The Taliban and Al-Qaeda have now joined hands with the favourite protégé of the ISI in Afghanistan, Mr Gulbuddin Hekmatyar, to attack American troops and their Afghan allies in the Hamid Karzai government. These attacks will be intensified once the American war in Iraq intensifies and the predominant focus of American military attention shifts from Afghanistan to the Persian Gulf. The Washington Post has recently reported how General Musharraf continues to run with the hare and hunt with the hounds. Earlier restrictions placed temporarily on jihadi outfits like the Lashkar-e-Toiba and Jaish-e-Mohammad have been removed. Even as General Musharraf swears by his commitment to the war against terrorism and seeks membership in the Shanghai Cooperation Organisation in meetings with President Putin of Russia, the Lashkar openly collects funds across Pakistan for “jihad in Afghanistan, Chechnya, Bosnia and Kashmir”. New Delhi will have to adopt a pragmatic and measured approach in dealing with the coming events in our west. In fashioning our approach to these events, we will have to be clear in our minds that the USA alone has the power to compel countries funding and supporting Wahabi extremism and promoting terrorist violence in our neighbourhood to change course. There is naturally concern about the impending American attack on a friendly and secular country like Iraq. A prolonged conflict in Iraq, marked by heavy civilian casualties, could have a profoundly destabilising impact, both internationally and in our entire neighbourhood. Many independent military observers expect the conflict to last around six weeks. It will be a tragedy if heavy civilian casualties mark the conflict. The Americans will hardly be in a position to claim victory, if this were to happen. A small incident from the life of Prophet Mohammed shows what sacrifice exactly is. Once he received a Christian guest from Najran in his house. There was no meal at night except some milk of a goat. The Prophet offered him the milk. The Prophet’s family went without meal that night although it had starved the night before as well. This is the right way to sacrifice for others. Eid is also a day on which Muslims remember the deceased, visit the sick, see relatives and friends, overlook grudges, help the needy and in general show kindness and generosity to all those whom they know. It is also a day for rejoicing and celebrating by getting involved in a good, clean and halal (rightful) enjoyment. Eid-uz-Zuha or Baqr-Eid, the festival of reminding one’s submission to God and the feeling of sacrifice and obedience attached to it, is also known as Eid-ul- Azha. The Islamic faith has it that Prophet Ibrahim was over 80 years old and childless. After sustained prayers, God blessed him with a child (named Ismael) at this ripe old age. Ibrahim was most gleeful and thanked God. But soon after the child had grown a bit, God ordered Prophet Ibrahim to leave alone the child and his wife Hajra in a hot and parched desert. The Prophet immediately complied with God’s command. Hajra, without whimpering, kept searching for water for her son who was getting dehydrated. She went up the two hills there known as Safa and Marwa. Today an important part of the Haj ritual is taking rounds of these two hills near Mecca. After taking rounds of these hills in search of water, when she returned, to her astonishment, she found that a spring of fresh water was spouting beneath the feet of her son. It was so fast that she had to say “ Zam, Zam!” (Stop, stop!). Today Zum Zum happens to be the most holy water for the Muslims. What the Ganga Jal is to Hindus, Zum Zum is to Muslims. This first trial by God, in which Ibrahim never wavered to leave his wife and child in the forlorn desert, wasn’t the only one. There were more in store for him. Once while dreaming, the Prophet saw that God wanted some sacrifice again. Therefore, Ibrahim sacrificed his favourite camel. But again the dream appeared demanding sacrifice. That time he sacrificed all his camels. But when the same command appeared thrice, Prophet Ibrahim understood that God demanded the sacrifice of his son Ismael. When he asked for his only son’s consent, Ismael was only too happy to ask his father to carry out God’s order. “I’ll be fortunate to be presented to God!” was Ismael’s response. Now the child was to taken to the sacrificial altar. While on the way Iblis (Satan) tried to misguide both father and son that God’s demand was only too unethical and tyrannical, and that they should not follow Allah’s command. It was futile on the part of the Satan and the father took out his knife to slash the throat of his son. At this the son shouted, “Father, please cover your eyes with a handkerchief so that you do not waver while sacrificing me. Ibrahim agreed and covered his eyes. After having accomplished the task Ibrahim removed the handkerchief from his eyes. What he found was something unbelievable. His son was laughing and playing. Instead, a ram was lying sacrificed at Ismael’s place. This was the reward of God. The story also resembles the story of Job in the Bible where he too sacrificed his animals and every near and dear one to God. The Haj, world’s unique pilgrimage of its kind, gets completed the day. Prophet Ibrahim went out for the sacrifice of his only son. It is quite clear that God didn’t want the sacrifice of flesh and blood for His own sake. What He wanted to test was the love and loyalty of His Messenger. BABANPUR (Haryana): Deshraj Buta, a young and educated Sarpanch from Babanpur village in Haryana, is a handsome young man with a mission to turn his village into a model for the rest of the state to follow. Buta, a Dalit, has faced social discrimination and other hurdles in his life to reach the post of Sarpanch. In the past two decades, many things have changed in the village. Now, for addressing issues ranging from building a bus stop to settling land disputes, villagers turn to Deshraj Buta for solving their problems. Buta still gets nostalgic about his childhood when he along with fellow Dalit friends were not allowed to enter the village temple and they sat outside during the distribution of prasad after the puja. However, there is no bitterness in him now. “We cannot be vindictive now but I will ensure that such discriminatory practices are not followed today,” Buta said. He has been instrumental in generating resources for the village temple and has built a rest room and community hall. Babanpur village bordering Punjab has a population of about 2,000; 40 per cent of them are Dalits. The village falls under Fatehabad district and is essentially dependent on agriculture. Dalits mostly work as agricultural labourers in the land owned by upper caste farmers. Buta who was elected as Sarpanch for the second time has been instrumental in bringing about many developmental works in the village. The village has all-weather roads and a primary school. “By the end of the tenure, I will ensure that the primary school in my village is upgraded to a high school”, he said. He has studied till graduation and been a student leader for the past few years. “Despite economic prosperity in Haryana, society remains a male bastion”, he admitted with a sense of guilt. He feels that although the scale of caste discrimination has gone down, people still consider caste identity more important than their economic success. He laments that despite electrification of the village, acute shortage of power adversely affects people. “What is the point of having a connection, when power comes few hours everyday?”, Buta questions. Scarcity of power has hit villagers hard this year due to the inability of the farmers to properly irrigate their land. Acute power shortage and lack of employment opportunities in the backward block Ratia of Fatehabad district has forced Dalit youth leaders such as Buta to fight the next Assembly election in Haryana. “A Member of Legislative Assembly (MLA) commands respect from the governmental machinery than a Sarpanch”, Buta acknowledged reluctantly. He is very candid about his larger political ambitions. In future he intends to influence the larger developmental process, which will ensure social justice. Buta has been lobbying hard with the political establishment for a college and a vocational training institute for women for Babanpur. Another feather in his cap is the recent launching of the Haryana Sarpanch Sangathan in Fatehabad and Mahendragarh districts; this is expected to cover the rest of 17 districts of Haryana. The Sangathan has already enrolled more than 100 Gram Panchayats (members) from two districts. After the launch of the network, other Sarpanchs have also associated themselves with it. With the gradual emergence of this power block, Buta expects the Sangathan to emerge as the most vocal support for panchayati raj in Haryana. “We are expecting to launch the Sangathan throughout the state in the next couple of months”, a Sarpanch from Mahendragarh district has said. In April, most of the Sarpanchs in Haryana are expected to attend a mega event for the formal launch of their initiative. Women’s participation in public life, especially in Gram Sabha meetings, remains an area of concern for the state. Traditionally, the rural areas of Punjab that later became Haryana had the institutions of bhaichara (caste) panchayats. These panchayats were controlled by landowning peasant's castes of the village for adjudication of disputes and for performing local government functions. Over the years, in spite of its weakness and its being dominated by the bureaucracy and politicians, the introduction of panchayati raj had created greater political awareness in rural society and provided the rural masses increased opportunities for political participation. It sounds easy to lose weight. But as the sobering statistics show, it is more easily said than done. Most people with growing girths — and it is a worldwide problem — will in the end be unable to overcome biology and lose much weight unless some big changes occur in society, experts agree. “Maybe the answer is, in part, reducing our expectations,’’ said Jeffrey Friedman of the Howard Hughes Medical Institute at Rockefeller University in New York. More than 60 per cent of Americans are overweight. And more than 30 per cent of Americans are obese, meaning they carry so much extra weight that their health is at real risk. Obesity can lead to diabetes, heart disease and some forms of cancer. Worldwide, more than 300 million people are obese, according to the World Health Organisation. Thinking about your own deficiencies you can stop finding fault with others. Do not criticise others as it may not yield good results. With sympathy and mercy, put up with the sorrow inflicted on you by others.